In my home county in Eastern Washington State, USA, there is a joke that there are really only two things to do: stare at cows or become a methadone addict. I believe this is one of the reasons I became an artist—I chose to stare at cows. Tending a small family farm before and after school, I had to make sacred that same patch of pig muck day after day or risk dreariness, weariness, boredom. Bred an early riser, I would collect eggs from the chicken coop each morning for my father to fry. One of the greatest and most simple joys of my childhood was the ceremonious cracking open of eggs laid by young hens to discover a double ‘yolker’ that always followed my trips across the frosted or pollen-dusted field beside my house. Maybe this delight found in simple chores can help explain the delight I felt upon first viewing Rituals by Marianne Lettieri. Rituals has a rich simplicity to it. Everyday objects and everyday moments pass by the window of time and it is the artist’s role to sit at that window, which the renowned American author Billy Collins refers to as the poet’s place: it is their job to see the variations, to draw “rituals” from the redundant and the routine. Each morning an egg is fried—each morning it is different. 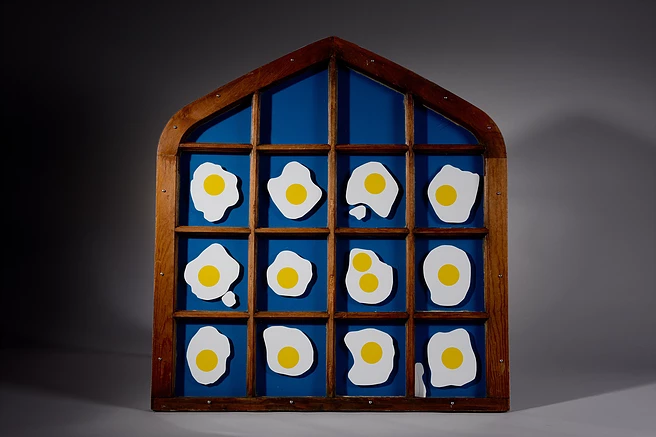 Letterieri’s work with found objects not only reimagines the purpose of those objects, like the Victorian window in this piece, but it also imagines the way audiences should go forth in their viewing. Redundancy dulls us. But the continuous rites in our lives—like that of breaking fast, without fail, every morning—they can redeem the routine. The attention to a sunny-side-up egg’s myriad forms is itself a form of devotion. The ability to stare at cows saves small towner after small towner from despair. And this is the purpose of rituals, the reason I as a child would ask to attend our town’s primarily Hispanic Catholic church for mass: rituals celebrate the difference in their repetitions. They contain in their recipes infinite possibility. Their restrictions inspire freedom within the frame, push us toward beauties we would otherwise never wait to see. A work like Rituals does not need to be difficult or complex to slow the audience down. Instead, it acts as a soft-spoken voice, inviting viewers to lean in closer, to sit with the present and the art for a while. Marianne Lettieri: Rituals, 2016, 39”x36”x2”, Victorian window, sheet glass and acrylic, vinyl. Marianne Lettieri is an American visual artist, whose mixed media constructions investigate individual and cultural values associated with everyday objects and discarded materials. She is especially interested in the process by which relics of the past illuminate and inform contemporary social and political contexts. She presents commonplace artifacts in new configurations, reinforcing the interconnectedness of people and communities through time and the shared human desire to remember. Recent solo exhibitions include Marianne Lettieri: Reflections at San Francisco Museum of Craft and Design; Strings Attached at Monterey Peninsula College; House/Work at Peninsula Museum of Art (Burlingame, CA); Evidence of Life at Doug Adams Gallery|Badè Museum and Changing Context at Azusa Pacific University. Her artworks are in the collections of San Jose Museum of Quilts and Textiles, Oracle Corporation, and City of Palo Alto. She has an M.F.A. in Spatial Arts from San Jose State University and B.F.A. in Drawing and Printmaking from University of Florida. S. M. Pruis is a student and poet under rainy Seattle, WA, USA skies. After leading a series of writing workshops at Mission Creek Corrections Center for Women in Belfair, WA, Pruis designed and edited the 2018 Keeping the Faith—the Prison Project Anthology. A senior marketing intern for Image Journal, Pruis has published poems in OUT/CAST and The Lingua Journal, among others. One poem is forthcoming in The Ocotillo Review.